The Congressional Budget Office (CBO) is a federal agency within the legislative branch of the United States government. It is a government agency that provides economic data to Congress. 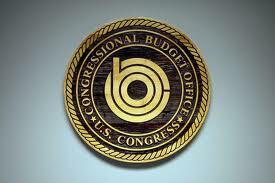 The CBO was created as a nonpartisan agency by the Congressional Budget and Impoundment Control Act of 1974. With respect to estimating spending for Congress, the Congressional Budget Office serves a purpose parallel to that of the Joint Committee on Taxation for estimating revenue for Congress, the Department of the Treasury for estimating revenues for the Executive and estimates required for the Congressional budget process. This includes projections on the effect on national debt and cost estimates for legislation. Under the Congressional Budget and Impoundment Control Act of 1974 the annual Congressional budget process begins with adopting a concurrent resolution on the budget that sets forth total levels of spending and revenues, and broad spending priorities, for several fiscal years. As a concurrent resolution, it is approved by the House and Senate but does not become law. No funds are spent or revenues raised under the budget resolution. Instead, it serves as an enforceable blueprint for Congressional action on spending and revenue legislation.